Creative Commons Attribution (CC BY): You can use, re-use, and distribute and re-use the materials as long as you meet the license condition. One condition is attribution, meaning that you need to make sure that the original author is appropriately credited. No big deal, just add the attribution in small font below the image. Creative Commons Zero (CC0): You are free to use the images in any scope you what without any attribution. The following resources let you use the materials free under the Creative Commons Zero (CC0) license. You can use them for commercial and non-commercial purposes. You do not need to ask permission from or provide credit to the photographer or the resource websites, although it is appreciated when possible. This site says, "Make something awesome. 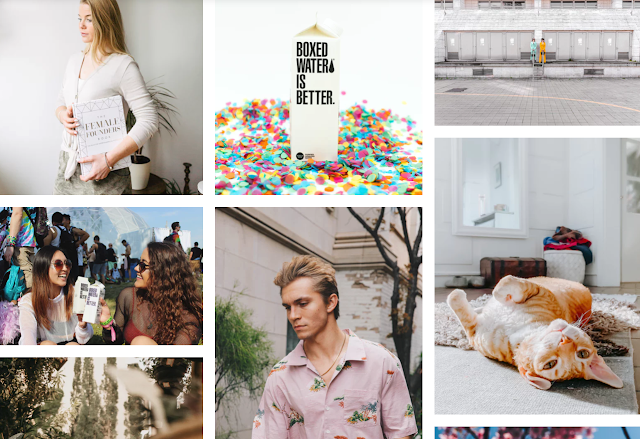 Over 300,000 free (do whatever you want) high-resolution photos brought to you by the world’s most generous community of photographers." A little bit of its history, - Unsplash started as a simple tool for creators. The concept was born from the pain we had in finding great, usable imagery. Today, Unsplash is a platform fueled by a community that has generously gifted hundreds of thousands of their own photos. Unsplash is active and growing, - thousands more being added each day. You may create a free account, or just download images directly without login. NegativeSpace aims to give visitors easy access to beautiful, high-resolution photography, all of the photos on this site are free. Free in cost as well as free to use under a Creative Commons CC0 license. Images are organized by categories: Abstract, Animals, Architecture, Business, Black & White, Food, Landscapes, Nature, People, Sport, Street, Technology, Transport, and Work. All photos uploaded on StockSnap are released for free under Creative Commons - CC0 and do not require attribution. We as users don't need to add attributions to images we use on our blogs. StockSnap identifies the author of each photograph and links back to their profile. This is the way for StockSnap to appreciate these authors and encourage new contributors. Pixabay is a vibrant community of creatives, sharing copyright free images and videos. All contents are released under Creative Commons CC0, which makes them safe to use without asking for permission or giving credit to the artist - even for commercial purposes. It has huge volumes of photos, images, vector graphics, illustrations, and videos. Pexels provides high quality and completely free stock photos licensed under the Creative Commons Zero (CC0) license. All photos are nicely tagged, searchable and also easy to discover through our discover pages. Currently, Pexels has over 40,000 free stock photos. Every month at least 3,000 new high-resolution photos will be added. Morgue File is a community-based free photo site, and all photos found in the Morguefile archive are free for you to download and re-use in your work, be it commercial or not. The photos have been contributed by a wide range of creatives from around the world, ranging from amateur photo hobbyists to professionals. Kaboompics is operated by Karolina, a photographer, graphic designer, and website creator. You are free to use our photos for purposes such creating graphic for your blog or social media, making HTML/PSD templates (for sale), decorating your articles, PowerPoint presentations, you can even print them on t-shirts. attribution is appreciated (not required). Life Of Pix has a lot of free high-resolution photos for personal and commercial use. New photographies are added weekly. All images are donated to the public domain. Ryan McGuire, a creative visual artist, is behind Gratisography. He photographed all pictures and made all the visual arts. He allows you to use them on your personal and commercial projects free of copyright restrictions. Picjumbo is free stock photo site created by designer & photographer Viktor Hanacek in 2013. Free images are categorized and tagged. In addition, Picjumbo offers Premium Subscriptions starting from $10/month for extra materials.